In my last post I talked some about how to make the Slumber fish in 3D, including modelling, rigging, and animation. Today I'm going to talk a bit more about the same fish, but focusing on the textures instead! 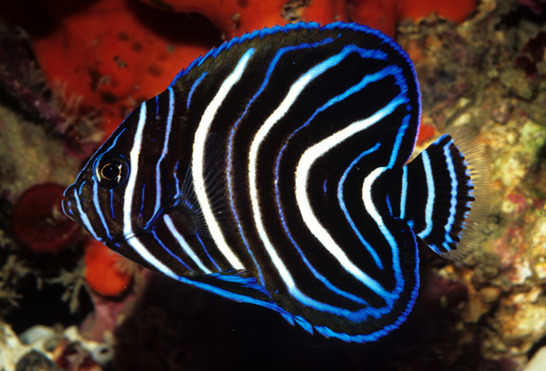 As an example I will go through the process of creating the juvenile Koran Angelfish below (credit to http://fishy-bizness.com/ for the picture). 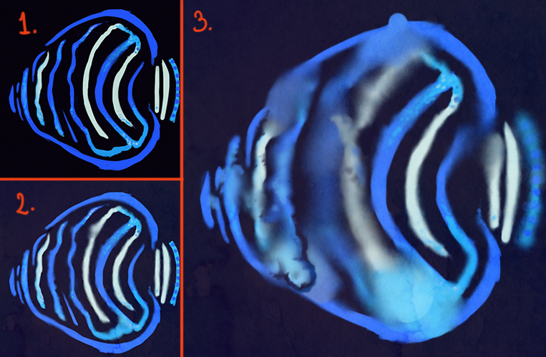 We chose to depict the juvenile version because it has a much more clear and readable pattern than the adult fish. Since you will rarely see both sides of a fish at the same time (they are quite flat), I chose to mirror the UVs and use the same texture on both sides. In the first draft (1) I just tried to get the basic shapes and colours down. When we put this into the game, however, it looked a little bit dull and not as "watercoloury" as we wanted. Therefore for version two (2) I experimented a little bit with smudging the edges of the patterns, as well as applying a watercolour texture on top of everything. This looked a little bit better, but when you only have a little bit of smudging in there it runs the risk of looking sloppy rather than intentional. So for the final version (3), I went full on watercolour. This might look a bit extreme, but it fits a lot better into the context of the game, and clearly communicates the watercolour effect we were going for. You might notice that the fish lacks side-fins and eyes! That's because they were added onto the fish as sprites and animated in Unity by Sebastian, and he explains a little bit about it in this post. You can see what the Koran Angel fish fin looked like to the right - yep, it's the blue thing there. We actually desaturated the whole texture a little bit and changed the hue to make it less blue, as we were trying to avoid the specific colour to allow for melatonin production in the players.